August Birthday Party was a lot of fun! At 10:40am the whole school sat down on the first floor for the party. Today we had 15 Birthday children who told us their names and ages. After that we sang Happy Birthday to all of them and gave them presents. There were many happy faces. 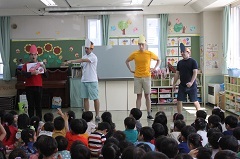 Next everyone watched a play performed by the English teachers. It was about colours. The four crayons didn’t get along but when they mixed they created new colours! In the end the colours worked together and drew a beautiful rainbow! 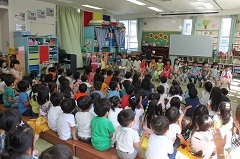 After that the white crayon and red crayon came back to talk about the Red Stars and White Angels who will be competing in the IYK Sports Festival! 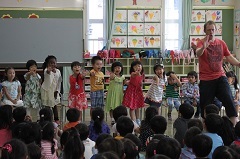 Today we also had music time! Another great event here at IYK!